When ride-sharing company Lyft announced its new service Lyft Line — which, for those unaware, lets people headed in the same direction share the cost of a ride together — the first thing I thought of was the California Public Utilities Commission (CPUC). Weird, I know. But CPUC was behind last year’s rule legitimizing for-profit ridesharing companies like Lyft, Sidecar, and Uber for legal operation within the state. Without that action, it’s safe to say an idea like Lyft Line would’ve been a major uphill climb — if it saw the light of day at all. 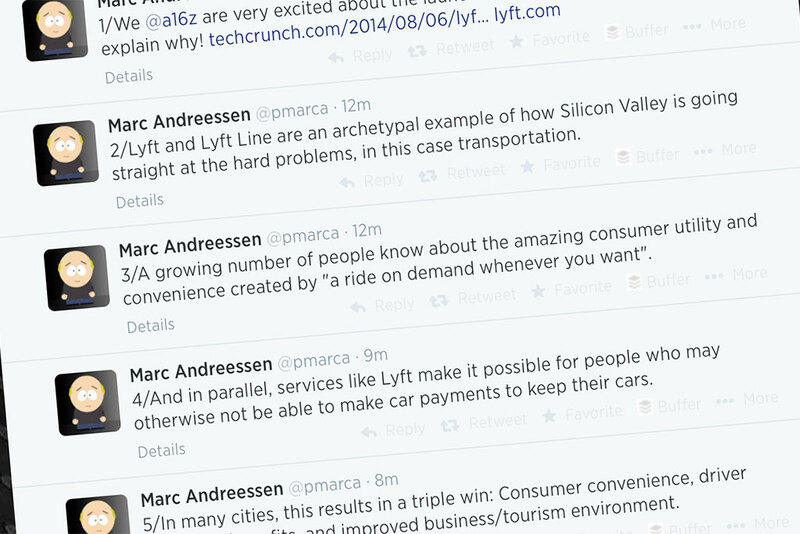 At the announcement of the new service, venture capitalist Marc Andreessen — an investor in Lyft — went on a Twitter firestorm extolling the virtues of the service. 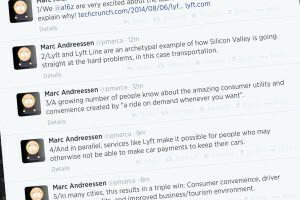 Never one to hold back, Andreessen called Lyft Line “an archetypal example of how Silicon Valley is going straight at the hard problems.” That may sound like bluster, but the dude has a point when it comes to the positive effect innovative companies like Lyft can have on cities facing transportation issues. Those positive effects go beyond helping to reduce congestion — a definite problem in the Bay Area, as any resident will tell you. As Andreessen pointed out, Lyft and other rideshare companies are also helping people earn a living. People who, in some cases, wouldn’t be able to afford car payments otherwise. For them, Lyft is basically a disruption to what could easily be a disruption to their lives and livelihood. Will Lyft Line take off with the public? It’s far too early to tell, although Andreessen is of course bullish. But what isn’t too early to tell is the positive impact CPUC’s decision to make ride-sharing companies legal is already having in the state. By crafting sensible legislation acceptable to both startups and entrenched services like taxis, CPUC has created the roadmap (apologies for the pun) for how other states and cities should approach ride-sharing. Innovation may be an overused word these days, but in Silicon Valley and other cities in California, innovation is what keeps the economy moving forward. Rather than bring down the heavy regulatory hammer, CPUC wisely focused on ensuring an environment where things like the ride-sharing industry can bloom and grow. That’s how the regulatory process should work. Other states would be smart to pay attention. Great article. Absolutely the right approach. We are legislating ourselves out of innovation and advancement every day. Nice to see a step in the direction of ‘real’ capitalism as opposed to the protectionist bent of most legislation these days.